Robert "Bob" Paisley OBE (23 January 1919 – 14 February 1996) was an English footballer and manager. He played for Liverpool as a left half between 1939 and 1954. He later managed Liverpool between 1974 and 1983. Paisley and Carlo Ancelotti are the only managers to have won the European Cups three times. He won 20 major honours with Liverpool as a manager. Paisley was born in Hetton-le-Hole, County Durham. He married Jessie in 1946. The couple had two sons and a daughter, Robert, Graham and Christine. Paisley was diagnosed with Alzheimer's disease in 1992. He died on 14 February 1996 in Liverpool, at the age of 77. ↑ Martin, Andrew (14 February 1996). "Liverpool legend Paisley dies aged 77". The Independent. Retrieved 12 February 2017. 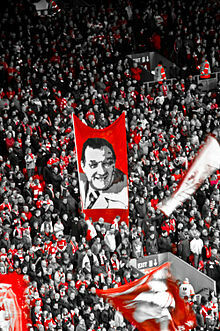 Wikimedia Commons has media related to Bob Paisley. This page was last changed on 30 August 2017, at 22:13.